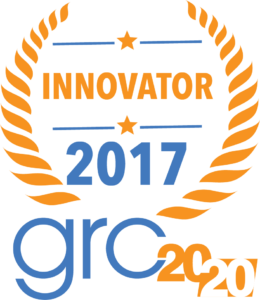 GRC 20/20 is accepting nominations for the 2017 GRC Innovation & User Experience Awards! User Interface & Experience. GRC 20/20 is putting specific focus on the fact that GRC solutions do not have to be ugly and cumbersome. Other Innovation. Any innovation that is not tied to user interface & experience. You need to be logged in to submit the form. Please login first! If you do not have a login, please register for a FREE or PAID subscription (either work). Please fill out the nomination form below with any relevant screen shots, technical details, product briefs, and video demonstrations. It is strongly suggested that you print the form below and you gather your information and craft your answers before filling out form and submitting. There is a save and continue button at bottom of form. Please print your form before submitting as well as save the text of your answers. If you do not get a confirmation at the top of the page after submission then there may have been an error. Any questions please send to research@grc2020.com. The details requested in this section are for the organization overall and not specific to the solution. Please enter the contact information for the primary individual responsible for this nomination. Please enter the details for this nomination. Is this solution and innovation operating in real-world client environments as of this nomination? Concepts, good ideas, prototypes, etc. will not be considered. The innovation has to have real-world implementations that can vouch for the innovation (client reference asked for later). Please avoid hyperbole and stick to specific facts and details. The nomination has to be something released or made available in the past year. Basically, why would organizations care about this and what value does it bring them. Please submit a client reference that we can call that can validate that this innovation / solution is operating in the real-world and delivering as indicated on this nomination.